Holistic Sun. By Marc Sorenson, EdD. The term holistic (my definition) derives from the word “whole.” Hence, the term incorporates the idea that in nutrition, a whole food functions better than any of its parts. And, it means that when we treat diseases, we should treat the whole person. As an example of holistic nutrition, consuming whole-grains associates with better health than consuming refined grains. Probably, the poor results associated with refined white bread are due to the removal of nutrients during processing. As a result, the bread is no longer holistic. Furthermore, we can state that it is no longer a whole food. Stay with this discussion. Holistic sun will be discussed to sum up. Especially relevant is that whole rice strongly associates with protection against disease, whereas refined rice increases risk. Another example is the case in which a nutrient from a plant is extracted and encapsulated. Since the nutrient is subtracted from a food, neither the nutrient nor the food remains holistic. And, such food manipulation is based on observations that high levels of the nutrient in the body is associated with better health. Therefore, we might expect this encapsulated product to produce healthful outcomes. And, in some cases it does produce positive results. However, the product may also be totally ineffective or counterproductive. An example of this is supplementation with beta carotene. Beta carotene is a nutrient found in carrots and other orange and yellow vegetables. Since people who consume large quantities of these vegetables seem to be healthier, a question emerges. Could concentrated beta carotene produce a health miracle? Testing the possibility: Can supplements beat holistic vegetables? So to test that possibility, researchers gave one group of cancer patients beta carotene pills (not holistic). They gave other patients a placebo. Opposite from the researchers’ expectations, the cancer increased with beta carotene supplementation. Consequently, these adverse results led to the discontinuation of the research. Furthermore, similar results have been shown with vitamin E supplementation. While beta carotene and vitamin E are wonderful, they must work as part of the holistic team. What about the health of those who eat holistic foods containing beta carotene? And what about those who have high beta carotene levels due to a high intake of colorful vegetables? It is most noteworthy to again mention that high carotene levels still predict better health. These vegetables contain innumerable, healthful chemical compounds, only one of which is beta carotene. Hence, when beta carotene is part of the magnificent, holistic orchestra of nutrients, it helps to produce a beautiful health concert. In conclusion, whole foods—or holistic foods—will be better for human health than a single, isolated nutrient. And remember this. Junk foods are never holistic. Is the sun holistic, or do we need only to take a vitamin D pill? So, can the sun be holistic? Yes! First of all, the idea of a holistic sun was the reason I wrote my latest book, Embrace the Sun. I had noted numerous studies where vitamin D, the major photoproduct of sun exposure, sometimes failed as a supplement. In other cases it seemed to work quite well. Yet, when sun exposure was tested for the expected result, that result was almost invariably positive. At this point, I must make it clear that there are many studies showing that vitamin D supplementation can produce terrific, healthful outcomes. This is especially true when vitamin D deficiency is present. But since sun exposure produces many other healthful photoproducts, why should we settle for just one? Beyond vitamin D, here are few additional photoproducts produced by sun exposure. Sun exposure increases nitric oxide production, which immediately lowers blood pressure and leads to a decrease in heart disease risk. Taking a D pill does not produce this result. Sun exposure dramatically improves mood through the production of serotonin. This result is nearly immediate and not triggered by vitamin D.
Sun exposure increases the production of BDNF, part of a cascade of proteins promoting growth of neurons and preventing nerve death. This result is not triggered by vitamin D. BDNF is a major player on the holistic sun’s team. 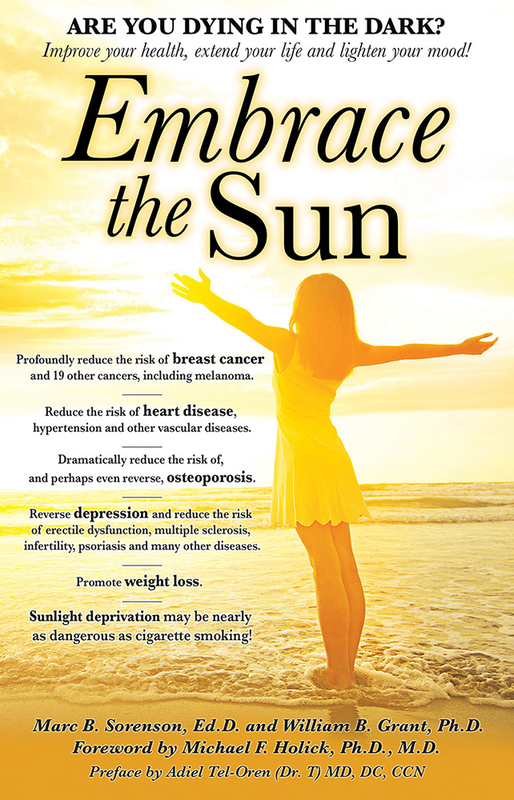 Sun exposure increases the production of endorphin, another mood enhancer. This is a non-vitamin D response. UVB light from sun, sunlamps or sunbeds directly helps heal psoriasis. This is not a vitamin D response. 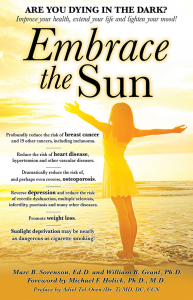 Sun exposure also leads to the production of several additional natural chemicals that enhance human health. Here are a few: Alpha melanocyte-stimulating hormone, Calcitonin gene-related peptide and Neuropeptide substance P. A full discussion of them here would become too cumbersome for this blog. So, suffice it to say that the holistic sun has many benefits beyond the production of vitamin D. And remember, sunbeds and sunlamps can furnish the holistic effects of sun exposure when sunlight is not available. These include the production vitamin D, which, when combined with the other photoproducts, enhances health to a far greater extent than vitamin D alone. Hence, we might say that the photoproducts of sun exposure are synergistic—the holistic sun being far more effective than any of its individual parts. When major players are taken away from the orchestra, the concert is not as good. Don’t let that happen with your holistic sun. Be sure that all of the sun’s remarkable photoproducts are working for you, including vitamin D.
In conclusion, Embrace the Holistic Sun safely and reap the health benefits. Don’t burn and don’t use sunscreens, which take away one of the major players in your orchestra: vitamin D. Have a sunny week! Tayyem RF, Bawadi HA, Shehadah I, Agraib LM, Al-Awwad NJ, Heath DD, Bani-Hani KE. Consumption of Whole Grains, Refined Cereals, and Legumes and Its Association With Colorectal Cancer Among Jordanians. Integr Cancer Ther. 2016 Sep;15(3):318-25. Alpha-Tocopherol, Beta Carotene Cancer Prevention Study Group. The effect of vitamin E and beta carotene on the incidence of lung cancer and other cancers in male smokers. N Engl J Med. 1994 Apr 14;330(15):1029-35. Weller R. The health benefits of UV radiation exposure through vitamin D production or non-vitamin D Pathways. Blood pressure and cardiovascular disease. Photochem. Photobiol. Sci. 2016. Aubert PM, Seibyl JP, Price JL, Harris TS, Filbey FM, Jacobe H, Devous MD Sr Adinoff B. Dopamine efflux in response to ultraviolet radiation in addicted sunbed users. Psychiatry Res. 2016 30;251:7-14.